Free office suite provided by Kingsoft Office is a practical alternative to expensive office software. You will be amazed at its wonderful features. 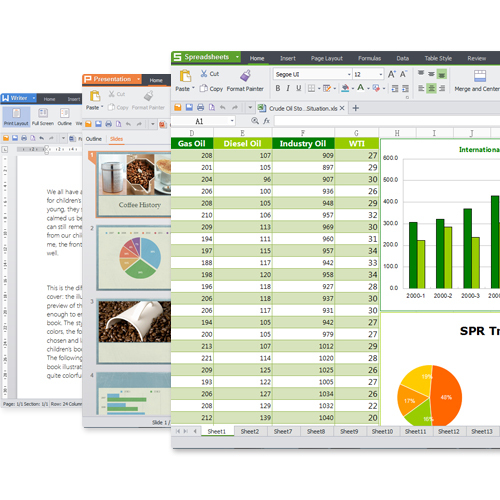 Kingsoft Office Free 2013 adopts a newly designed interface, which can be switched to the classic MS office interface. It takes user experience into full consideration--specialized paragraph tool, drag-and-drop table tool and tab mode make document editing more easy. In addition to the aforementioned, it has greatly-improved compatibility with MS office. You have no need to download a compatibility pack for office 2007/2010. What are the key features of Kingsoft Office 2013? 1. Built-in spell check for US/UK English 2. Highly compatible with MS Office (97/03/07/10/13), which means you can seamlessly open, edit and save as both office 2003 and 2007 formats 3. Advanced paragraph adjustment tool 4. Intuitive table operation 5. Multiple tabs on the interface 6. Create multiple hyperlinks at one time in Spreadsheets 7. Set encryption for your documents 8. Convert office documents to PDF format 9. Directly send files as email attachments 10. Various free PPT templates.